A small volcanic eruption was observed on 24 June 2004 by a member of the South African National Antarctic Programme's (SANAP) over-wintering team on Marion Island (figure 1). While conducting fieldwork in a mountainous area on the S part of the island, David Heddings was able to video an eruption that comprised gas and small pieces of scoria (a few centimeters in diameter). Figure 1. The SANAP base station, located on the E side of Marion Island. Courtesy of Ian Meiklejohn. While it has been assumed that small volcanic eruptions often take place on Marion Island, the remoteness and hilly terrain over much of the island has meant that such events have not been witnessed. The last confirmed eruption on Marion took place in 1980 when ornithologists found a fresh basaltic lava flow on the W side of the Island. Information Contacts: Ian Meiklejohn and David Hedding, University of Pretoria, 0002, Pretoria, South Africa, 012-420 4049 (URL: http://www.up.ac.za/). The Global Volcanism Program has no Weekly Reports available for Marion Island. 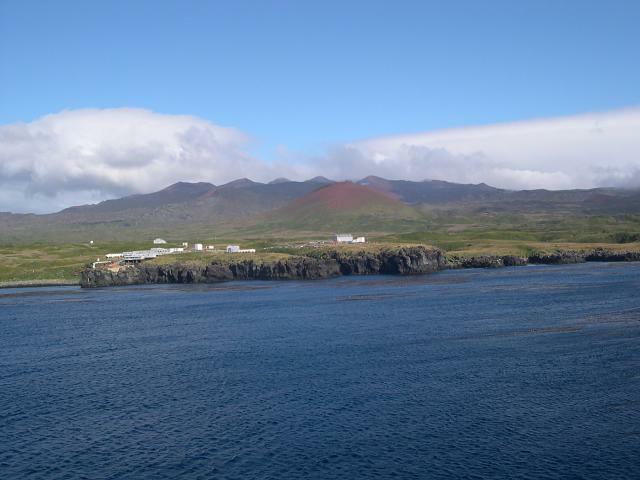 During the first week in November , research station personnel visiting the W side of Marion Island observed two new cinder cones, three small lava flows, and fresh tephra deposits, none of which were present when the scientists were last in the area in February. Russell and Berruti traveled to the eruption site in late November. Regrowth of burnt vegetation indicated that the activity had probably occurred at least 2 months earlier. The smaller of the two cinder cones, ~6 m high with a crater 15 m in diameter, had formed at the summit of Kaalkoppie, an eroded, 100-m-high tuff cone. A lava flow that apparently originated from the W (seaward) flank of the summit cone had poured over nearby cliffs 50-70 m high and ponded in a small amphitheater-like area at their base. About 10 m of lava remained in the amphitheater in November, but caves above this level were partially filled with lava. Some of the lava had drained from the amphitheater and continued ~100 m seaward, flowing into the ocean and forming a front ~ 120 m wide and 10 m high. A lava tube seen at the S edge of this flow in early November had collapsed by the time Russell and Berruti saw it on the 26th, forming a 4-m-wide trench. This flow covered ~2 hectares, including the portion between the summit cone and the cliffs. A second lava flow occupied a few hundred square meters of the promontory above the amphitheater. A small amount of this lava had spilled through a fissure onto the first flow, but most remained on the promontory or poured over its concave N cliff face into the sea. On the flank of Kaalkoppie, E of the new summit cone and near its base, a larger tephra cone had formed around a 35-m-diameter crater. The E side of the cone was breached by a lava flow, 35 m wide as it emerged from the crater, that eventually reached 50 m width before diverging into two lobes. One lobe flowed ~350 m to the NW, the second ~200 m to the S along a shallow valley. The total area covered by this flow was ~7 hectares. Irregular blocks and spheroidal bombs nearly 1 m in diameter were found on the flank cone. Fusiform and ribbon bombs fell as much as 350 m from the cone with heaviest tephra fall extending from its E, breached, side. A continuous layer of ash and lapilli covered an area extending several hundred m to the E and 40 m S of the two cones, with scattered fragments found 250 m to the S and much farther to the SE. Information Contacts: A. Berruti, Univ. of Cape Town; S. Russell, Univ. of Orange Free State; M. du Plessis, Geological Survey of South Africa; C. Hide, South African Embassy, Washington DC. Marion Island, South Africa's only historically active volcano, lies at the SW end of a submarine plateau immediately south of the SW Indian Ocean Ridge, opposite Prince Edward Island. The low profile of the 24-km-wide dominantly basaltic and trachybasaltic volcano is formed by two young shields that rise above a flat-topped submarine platform. The 1230-m-high island is dotted by about 150 cinder cones, smaller scoria cones, and coastal tuff cones. The earliest dated eruptions took place about 450,000 years ago, but much of the island is covered by Holocene aa and pahoehoe lava flows, and more than 130 scoria cones formed during the Holocene. Many of these appear younger than the 4020 BP peat layer overlying one of the flows (Verwoerd, 1981). Young unvegetated lava flows appear to be only a few hundred years old (Verwoerd, 1967). The first historical eruption, during 1980, produced explosive activity and lava flows from a 5-km-long fissure that extended from the summit to the west coast. McDougall I, Verwoerd W, Chevallier L, 2001. K-Ar geochronology of Marion Island, Southern Ocean. Geol Mag, 138: 1-17. Verwoerd W J, 1971. Geology of Marion and Prince Edward Islands. In: Bakker E M, et al (eds) Marion and Prince Edward Islands, Cape Town, South Africa: A A Balkema, p 40-62. Verwoerd W J, Chevallier L, 1987. Contrasting types of surtseyan tuff cones on Marion and Prince Edward islands, southwest Indian Ocean. Bull Volcanol, 49: 399-413. Verwoerd W J, Langenegger O, 1967. Marion and Prince Edward Islands geological studies. Nature, 213: 231-232. Verwoerd W J, Russell S, Berruti A, 1981. 1980 volcanic eruption reported on Marion Island. Earth Planet Sci Lett, 54: 153-156. There is no Deformation History data available for Marion Island. There is no Emissions History data available for Marion Island. Marion Island, South Africa's only historically active volcano, is seen from the NE with the meteorological station in the foreground. The cinder cone in the middle distance is the lowest of a NE-trending chain of cones extending from the near the summit of the shield volcano. The meteorological station overlies older Pleistocene lava flows. The 1230-m-high island is dotted by about 150 cinder cones, smaller scoria cones, and coastal tuff cones, most of which formed during the Holocene. The first historical eruption took place in 1980. Photo by Ian Meiklejohn (University of Pretoria). The Global Volcanism Program has no maps available for Marion Island. There are no samples for Marion Island in the Smithsonian's NMNH Department of Mineral Sciences Rock and Ore collection. Large Eruptions of Marion Island Information about large Quaternary eruptions (VEI >= 4) is cataloged in the Large Magnitude Explosive Volcanic Eruptions (LaMEVE) database of the Volcano Global Risk Identification and Analysis Project (VOGRIPA).